Experience an authentic voyage under full sail on this unique cruise to the exotic island of Borneo on board tall ship Star Clipper. Visit remote islands, explore stunning national parks, delve into dense rainforest and try snorkelling, diving and kayaking in the warm, crystal clear waters of Borneo. Discover Brunei, one of the world's smallest and richest countries, en-route to the island nation of Singapore. Kuching is the capital of Sarawak and is the gateway to rainforests, the wild coast and several stunning National Parks. Highlights of this sophisticated city include the revered Cat Monument, brightly coloured Chinese temples and famous Sarawak Museum. The coastal town of Bintulu is the gateway to Similajau National Park. This coastal park is home to golden sandy beaches, tropical rainforests and amazing wildlife including Irrawaddy dolphins, green turtles and long-tailed macaques. The pleasant town of Miri is a great base for exploring the national parks of Gunung Mulu, Lambir Hills and the ancient Niah Caves. A number of reefs just offshore from Miri provide excellent diving opportunities. Brunei was once one of the great dynasties of Southeast Asia, ruling over the whole of Borneo, and today is one of the world's smallest and richest countries. 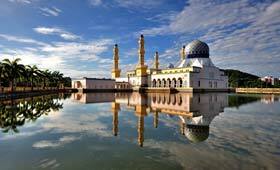 Bandar Seri Begawan, the capital of Brunei, is home to elegant mosques, museums and palaces. The islands of Pulau Tiga were formed by volcanic eruptions in the 19th century. Relax on the beach, hike in the forest, snorkel in the clear waters or take a cooling dip in the therapeutic mud pools. Disembark Star Clipper in Kota Kinabalu. For navigational reasons the Captain of the ship reserves the right to modify the cruise itinerary. Please note the reverse direction is a 11-night cruise which visits Nongsa Point Marina (Indonesia).